Catnip is a common herb that thrives in much of North America and is very easy to grow. While you've probably heard that catnip makes cats something like tipsy, you might not know that this effect is an inherited trait and does not affect all cats. Catnip can be planted in your garden in spring or fall, from seed or plants. It will sprout in two to three weeks if started from seed. Catnip grows to a height of three or four feet and has featherlike, light green foliage and small clusters of lavender flowers that grow on spikes. A member of the mint family, catnip is also used in food and herbal remedies. For example, tea made from the leaves and flowers of Nepeta cataria is said to relieve coughs. The oil extracted from catnip plants is even used in natural mosquito repellents. If you're planning to grow catnip, for your cat or yourself, keep in mind that there are different types of catnip and that all common types are invasive. This means they can take over your garden—even if they don't take over your cat's mind. Catnip plants have naturalized in various parts of North America, and even where they are not perennial, they will likely reseed. In fact, many gardeners find catnip to be too weedy and too aggressive of a spreader to grow it in their landscapes. Catnip grows best in full sun combined with average, well-drained soil and regular watering. Cutting the plants completely down after the first bloom set will allow enough time for it to completely regrow and bloom again. Some species of Nepeta are considered invasive plants. They will spread out of control unless you take measures to keep them from doing so. To contain and shape catnip plants, pinch them often while they are growing, to obtain dense, well-shaped plants. The plants will also reseed all over your property if you let them and you will have new plants springing up in unexpected places for years to come. To prevent the plant from blooming, simply pinch off the top of the plant when flowers start to form. To avoid damage from unwelcome neighborhood cats, consider protecting your catnip with some type of enclosure. Insects and rodents are not a problem, and catnip does not tend to suffer diseases. 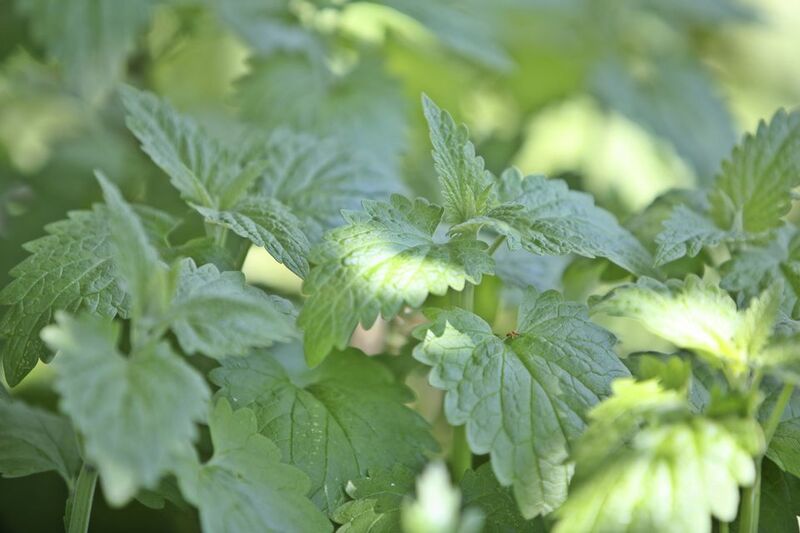 Catnip plants do best in full sun to partial shade and are drought-tolerant ground covers, making them a good choice for sunny, dry areas where many other plants would struggle. Like so many herbs, this perennial thrives in poor soil that is well-drained. Catnip plants prefer a slightly alkaline soil but are not very fussy about the ground in which they grow, as long as their roots are not constantly sitting in water. Water catnip plants regularly, but be careful not to overwater. Allow the soil to go almost dry between watering, then soak thoroughly. Plant catnip in soil that registers a minimum of 60 degrees Fahrenheit. It will grow well outdoors in the 55 to 85-degree range. You do not need to feed catnip. Plant taxonomy classifies catnip plants as Nepeta cataria. Note that the common name "catmint" is preferred in the U.K. It may be tempting to use the two names interchangeably, but in the U.S. we tend to reserve "catmint" for the ornamental relatives of N. cataria. Fewer cats are attracted to ornamental types. In any case, look for the scientific or botanical name when shopping for plants to be sure you get the right type of catnip. Most people associate catnip with its psychoactive effect on cats. The effect occurs when the leaves are eaten or when the plant's fragrance is inhaled by cats. In fact, simply smelling catnip is often enough to cause cats to react to it, which is why you sometimes see them rolling in it. The resulting drug "trip" is a reaction to the chemical nepetalactone. An inherited trait, only some cats have nepetalactone reactions. Fortunately, it's not addictive or harmful to cats, according to many veterinary sources. Harvest catnip upon flowering, on a dry, sunny day. Late morning is a good time to harvest after the dew has dried but before the day heats up. Cut off the whole plant at the base, and hang it upside down, as soon as possible, in a dark, dry, well-ventilated place (for example, an attic). Store dried leaves, stems, and flowers in freezer bags to preserve the potency of the oil inside them. These steps help minimize the loss of the oil, which is the stuff that makes your cat go wild. First, you need to stratify the seeds: Place them in the freezer overnight and then in a bowl of water for 24 hours. This process will damage the seed coat and will facilitate sprouting. Seeds should sprout in ten to 20 days and then you can plant them, indoors or outdoors. Space them so that plants are 18 to 20 inches apart.